You guys, I’m so pumped for today’s post! I was asked by RJR Fabrics if I’d like to be part of their What Shade Are You blog hop, featuring Cotton Supreme Solids, and of course I jumped at the chance! Solids are my first love, so I was excited to get in on the fun. I knew I wanted to do something simple, graphic and bold. I’ve had an idea in my head for a while, and this seemed like the perfect time to try it. So, with my pattern in mind, it was time to choose my fabrics! After browsing the beautiful range of colors, I decided on this palette of lovely jewel tones. 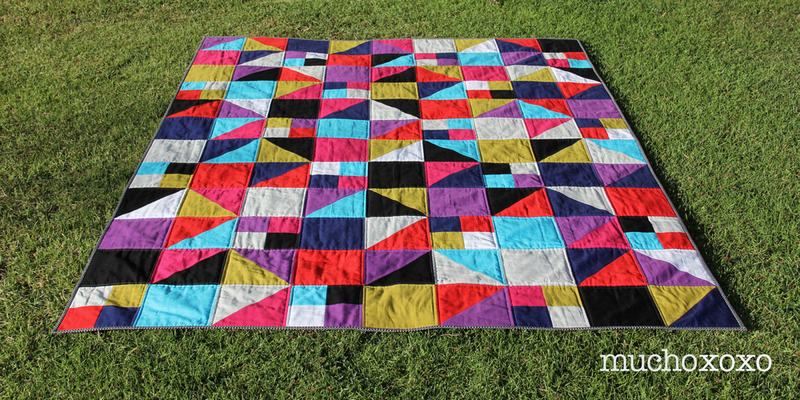 The quilt is a combination of squares, HSTs and 4-patches. The finished size is 63″ x 84″, perfect for curling up on the couch with a big glass of wine cup of hot tea. I’m a big fan of bright colors and high contrast, but this pattern would look great in any palette. I may have to try it with prints too! For the back, I took all my leftover bits and did a little improv panel to break up the black. I kind of LOVE IT. 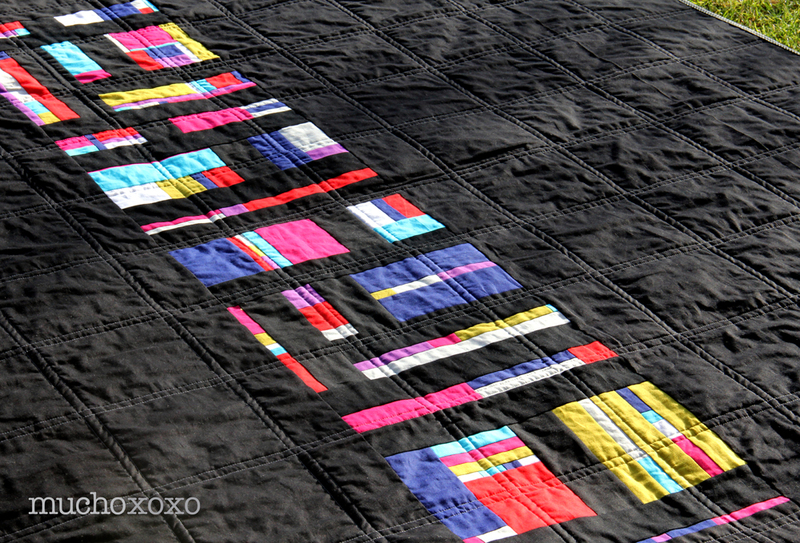 I bound the quilt with Netorious in black from Cotton + Steel. Yum! I kept the quilting simple and stuck to the grid. I used a lovely grey Aurifil 50wt that blends beautifully with the different colors. It’s already so soft, I suspect this is going to be deliciously cozy after a wash and fluff. This was my first time working with Cotton Supreme Solids, and I have to say I’m completely smitten! The fabric is super soft with a nice drape, and it sews up like a dream! They definitely give other premium solids a run for their money. 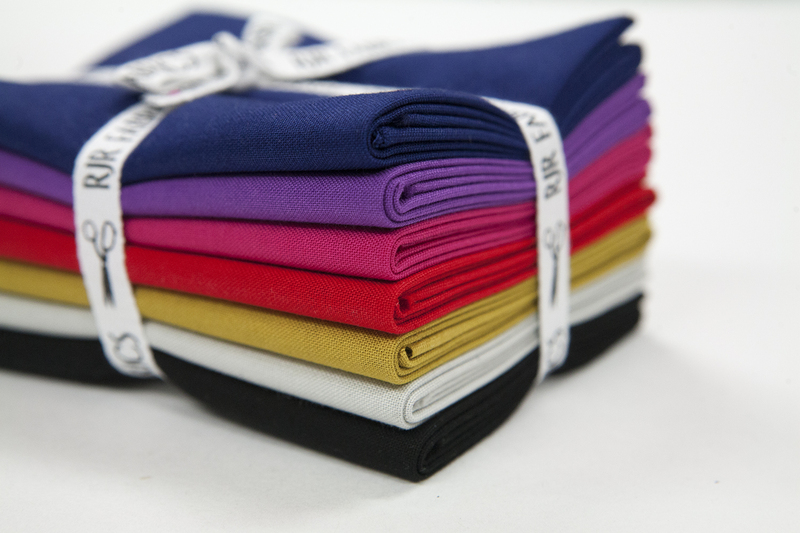 And if you like working with Cotton + Steel fabrics, you’ll love these! If you use a lot of solids, I’d recommend picking up a color card for easy reference and to take the guesswork out of online ordering. 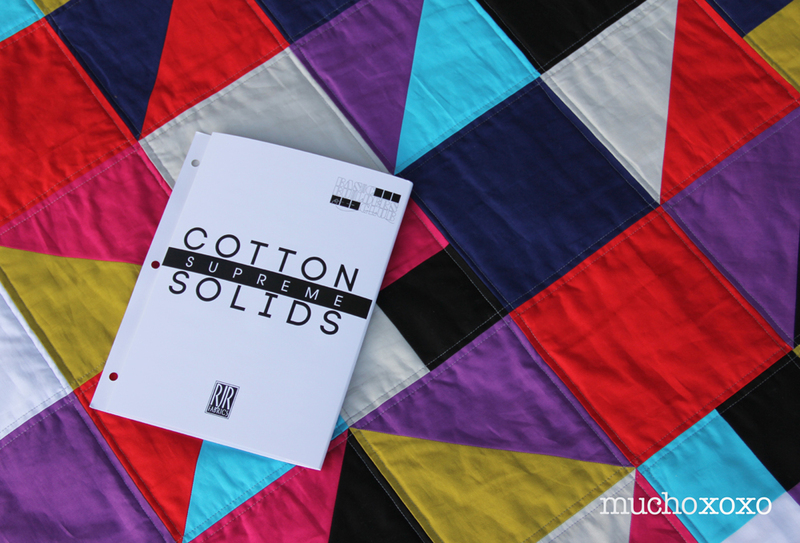 Ready to give Cotton Supreme Solids a try? 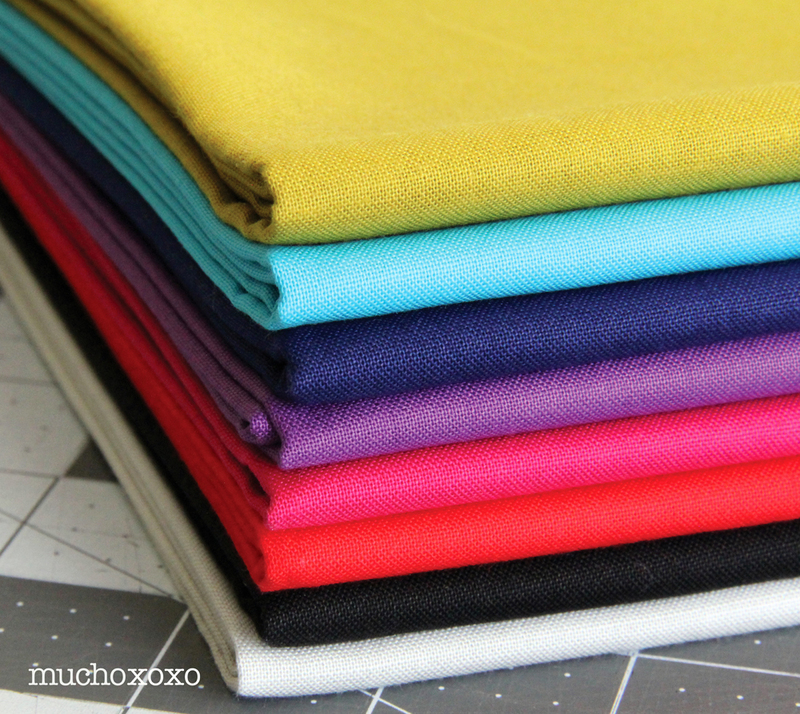 RJR Fabrics has generously provided a fat quarter bundle of my color palette to give away to one lucky winner! (The lighter blue is missing from pic but will be included in the bundle). Leave a comment letting me know what you would make with these. *Only two entries per person please. *The giveaway is open to the US and Canada. Sorry, no PO Boxes. *The giveaway will remain open until Wednesday, April 15th at 9pm PST. One winner will be chosen at random and announced here, as well as being notified via email, by Thursday, April 16th. Be sure to visit the RJR facebook page to check out the other participants’ projects. There’s some great stuff, and a new post goes up every Friday. I think there might be a little nap in the sun in my future. I love your quilt and would love to make one similar!! I love how these look at HSTs, so maybe i would go that route too, maybe a little like the Rebel quilt from libselliot? Love your quilt. The colors are wonderful and the pattern so lively! I love your quilt. I am sure I would make a quilt, the colors are wonderful but I don’t know what pattern right now. Oooh I love me some jewel tones! I think these would be great with better of thread’s new Icon block. Love playing with solids too!! OMG! is what I thought when I saw this beautiful quilt! I would like to make one similar with a little flare of libselliot! Thank You for the chance to win. I follow you on IG too! I would use these to make a Lone Star quilt. I inherited one my great grandmother made and I would love to make a companion to it. I haven’t done much with solids. I would like to use this bundle to make some pillows. I don’t know what pattern I would use, but I would like to use the fabrics in a quilt. I would like to use them with some prints for tote bags. Your quilt is stunning! The blue in it is perfect to bring it all together. With this fabric I would really like to try a similar quilt. Thanks for the giveaway! I follow you on IG. My IG name is vdegnan. What a happy fun quilt! Thanks for sharing it. I would use this fabric for some bright pillows for my porch! Thanks! I working on a quilt right now using RJR Cotton Supreme Solids paired with Cotton + Steel print (Hat Box). I absolutely love them! What a great selection of colors you chose for your project. I think you are right…a color card is a fantastic resource for reference. Publish the pattern please! Pretty please?! 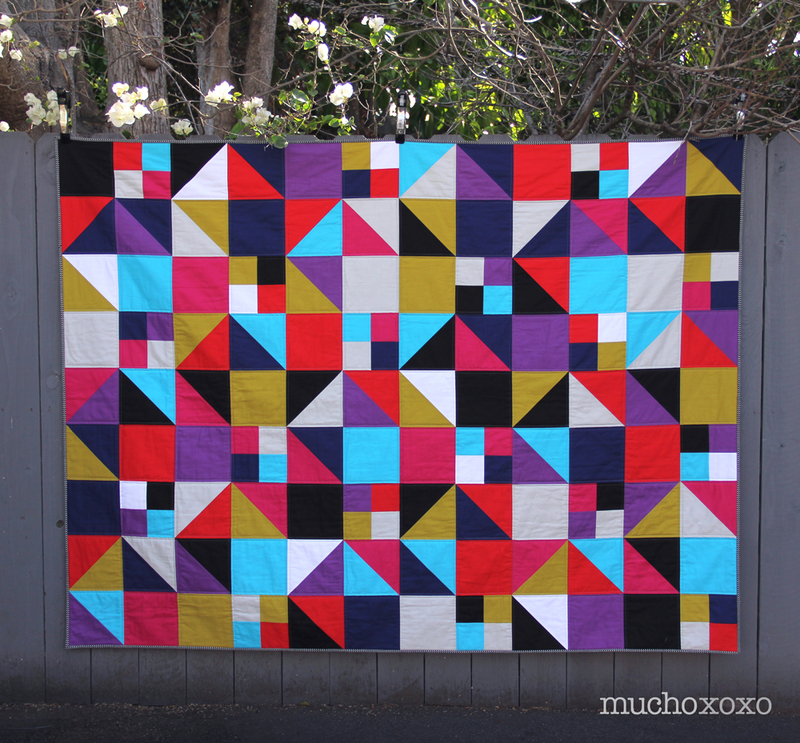 This quilt inspires me to make something out of solids in the near future!! 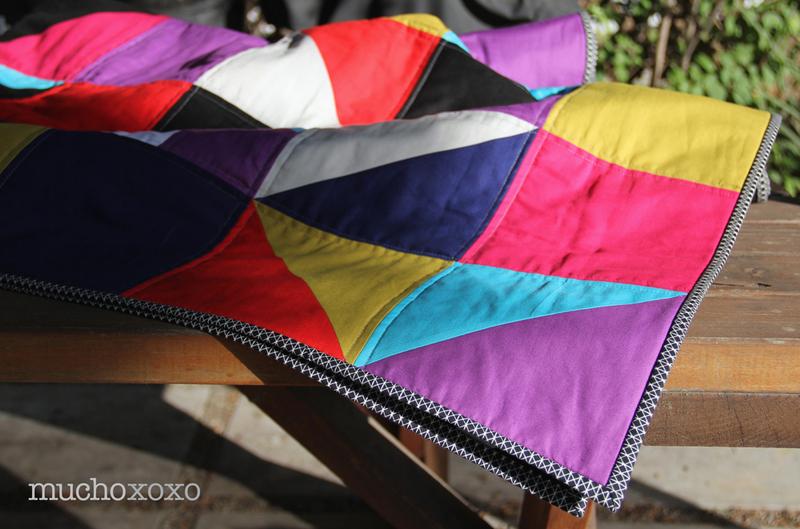 I LOVE YOUR QUILT, ITS GREAT CONTRAST AND YOUR REALLY COOL IMPROV BACKING! AS FOR WHAT I’D MAKE WITH THE FQ BUNDLE OF YOUR COLORS, THERE ARE A THREE BABY QUILTS ON MY HORIZON WHICH WOULD BENEFIT FROM THOSE LOVELY FABRICS. I would love to make “mind the gap” with this bundle! Love your quilts. Gorgeous quilt!!! I would attempt to make a I I-version if I were the lucky winner of this bundle. How about a new tote! I’d make a quilt too! I am a quilter at heart. I would have to make a quilt with them. I love the quilt you did. I always run to print fabrics for my quilts. I actually have never used all solids in a quilt before. I think I will use this bundle, if I am lucky enough to win, to make a solid fabric only quilt. Thanks for the chance. I follow you via Instagram. @jlcpowers is my name. Great colors, I would make a baby quilt with them if I won. Love the colors! I would definitely mix these with some of my favorite cotton & steel for a wallhanging for our new home. I would make a table runner. Love these colors so much! Gorgeous… I am planning a scrappy quilt for our cal king and these rich colors would work perfectly in my plan! A big thank you to all who stopped by and entered. I’ll be randomly selecting a winner soon, so stay tuned!